WEST CHICAGO, IL--(Marketwire - October 12, 2010) - Burpee Home Gardens is now accepting applications for the 2011 "I Can Grow" Youth Garden Award. 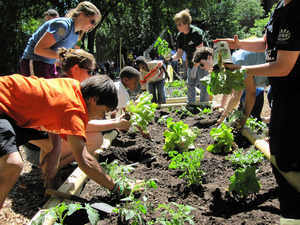 An extension of last year's "I Can Grow" program, the Youth Garden Award is intended to sponsor and support urban school and community gardens in cities across the United States in 2011. The 2011 "I Can Grow" Youth Garden Awards will be presented to established or start-up programs that demonstrate well-developed and staffed plans for a youth-centered educational program, with an emphasis on nutrition and food production, environmental awareness, social responsibility, and scholastic integration. The 2011 program will continue the theme Burpee Home Gardens established in 2010. "We launched the 'I Can Grow' program last year to support home vegetable gardening among younger and novice gardeners, and we were overwhelmed with the enthusiasm and support we experienced," said George Ball, chairman and CEO of the W. Atlee Burpee Company. Educators and community garden leaders can visit www.burpeehomegardens.com to download the application and review eligibility requirements. All entries must be postmarked by Friday, Dec. 3, 2010. Education - Learn through community and youth gardening projects across the nation. Eating better - Learn where your food comes from, and understand the benefits and values of adding fresh vegetables and fruits to your diet. Environment - Homegrown food production reduces food's carbon footprint. Economy - Supplement your food bill with our ongoing tips and tricks that help gardeners get the most from their vegetable gardens and save money. Thousands of children and community members were affected by the 2010 "I Can Grow" program. School, public and community gardens in Baltimore, Chicago, Dallas, Denver and New York received more than 6,000 plants in addition to garden installation materials from Burpee Home Gardens. The Promise of Peace Community Garden in Dallas was one organization positively impacted by last year's "I Can Grow" program. Burpee Home Gardens donated 20 garden plots plus the soil and plants to fill them. Elizabeth Dry, the executive director of the Promise of Peace Community Garden, realized the impact it has had on school and community children. "The garden has really brought unity to this community. We've had more than 3,000 people visit the garden so far." She added, "Gardening is a simple solution. It brings you back to the earth, and the kids learn from it. They harvest the rainwater and are seeing how it's healthier for the plants; they're getting scientific knowledge of decomposition and the nitrogen cycle from the compost piles; and they're learning lessons about the economic and nutritional value of growing and even cooking their own food." Jessica Romer, community initiatives coordinator with the Denver Urban Gardens, helped to coordinate the donation of Burpee Home Gardens plants to 13 school and community gardens in the Denver area. "It was such a positive partnership and the community absolutely benefitted from having the plants to fill in spaces that wouldn't have been planted otherwise." She went on to say that the vegetables are being used to help support a youth farmer's market program. "The kids are selling produce back into their communities, often times in places where they don't have fresh produce available in grocery stores. So we're not only trying to affect the youths' food behaviors, but also their parents' behaviors, because ultimately, the parents are making the buying decisions." ABOUT BURPEE HOME GARDENS®: Burpee Home Gardens is a program of garden-ready vegetable and herb plants available nationally at retail garden centers. Backed by the 125-year history of Burpee, the first name in home gardening, Burpee Home Gardens provides gardeners with time-tested varieties and information, ideas and inspiration for success. For more information, visit burpeehomegardens.com. ABOUT BURPEE: Burpee was founded in 1876 by seed pioneer W. Atlee Burpee. The company remains privately owned by George Ball, a third-generation seedsman, who serves as chairman of W. Atlee Burpee & Co. and is past president of The American Horticultural Society. Today, Burpee is the largest, most progressive garden company in North America offering seeds, garden plants and gardening supplies through the company website (www.burpee.com), direct-mail catalogs, and via retail garden centers nationwide. Burpee offers both heirloom and hybrid varieties, and is credited for introducing the world to numerous ornamental and edible breakthrough varieties during its 134-year history. Burpee's headquarters, display gardens and research farm are located in historic Bucks County, Pennsylvania.